This package combines all the elements needed to program and run three dimensional wood carvings. Probe or laser scan a carving pattern and create a CNC carving program. Refine and scale the program as needed. Production machine either flat or three-dimensional carvings. The CarvingShop Series packages are available from Thermwood, the oldest manufacturer of CNC routers. Thermwood has consistently been the technology leader in both CNC routers and in using CNC for production wood carving with more US patents on CNC router technology than every other CNC router manufacturer in the world, combined. The CarvingShop packages offer important features not available from anyone else, features important to your success. 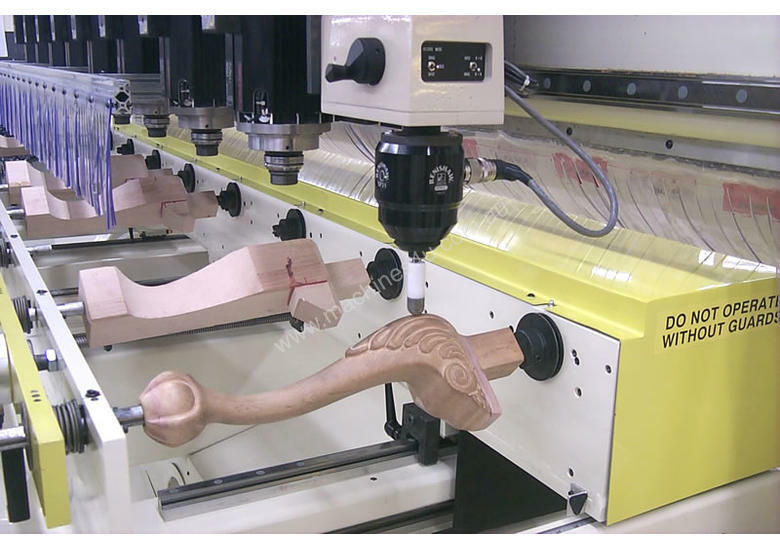 Success in automated wood carving requires an extraordinary CNC control, but it must also be simple and easy to use. This requires a control that is sophisticated enough to handle all the complexities automatically. During the mid 1970s, Thermwood sold the first CNC controls that were ever offered commercially. It used some of the first microprocessors off the production line. Before then, there were NC controls for sale commercially and CNC controls, using minicomputers, being used for secret defence programs but Thermwood was a true pioneer in modern CNC technology. Since then Thermwood has continuously refined and developed CNC control technology, receiving numerous patents in the process, until today, we offer the most powerful, most capable control on the market. And this same control is on every Thermwood CNC router, regardless of size or configuration. This control can carve, and do it well. This means every CNC router that Thermwood makes can carve. There are a lot of highly technical reasons for this but; the bottom line is that with Thermwood you are working with the company that has built more CNC systems specifically for wood carvings than anyone else. Some types of carving, such as monster heads for Hollywood movies, concept cars for automakers or three-dimensional spacecraft for NASA make even more demands on a CNC system. Programs for these parts are developed on sophisticated CAD systems that generate CNC programs that can be many gigabytes in size. They require a CNC control that can process tiny motions at incredible speed. Thermwood’s control easily executes these giant programs at super high speed, without pausing. This is something that few, if any other controls can claim. For production wood carving you need a system that can handle anything you throw at it. Thermwood offers such a system and, it is easy to use. The control does the difficult stuff automatically, so thousands of Thermwood controls are being successfully operated by ordinary woodworkers. And, with Thermwood, when you do need help, it is only a push of a button away. With Thermwood’s control you can connect to technical service and get help, assistance and advice when you need it. The connection is an audio, visual and data link. You see and hear the technician and he sees and hears you but he also sees deep into your system. You can get almost the same level of help as if the technician was right there in your shop and it is a lot quicker and easier. Wood carvings are unique because, in a way, they are art. A skilled woodcarver creates the initial model inputting his own unique style on a part. Then, you want to reproduce that part, over and over again. Turning the model into a CNC program has been one of the most serious stumbling blocks to widespread use of CNC for carving. After years of research and effort, Thermwood has developed efficient methods of creating these programs. In most instances you can use the same machine you carve on to develop the program. Thermwood offers two different systems. The first uses a touch probe and the machine control to scan the surface of the model. The basic shape of the part is generated automatically by scanning back and forth and then reproducing these scans. Detail is then added using different detail tools. These detail motions are added by an experienced carver, using essentially the same techniques he might use on a multi-spindle carver. He guides the probe tip over the model as the control remembers every movement, regardless of how subtle. We are not replacing the experienced carver; we are enhancing and multiplying his talent. Depending on the system, the final part can use up to eight different tools with completely automatic tool changes. The second programming system uses a non-contact laser to scan the part. The scan data is then processed through sophisticated software which creates the final program. With this system the computer determines all the motions so it is ideally suited for those shops that don’t have experienced carvers. It is faster than the first approach but, it is somewhat higher cost. Regardless of which programming method you choose, be assured the task of turning your hand made models into efficient CNC programs has finally been conquered. The CarvingShop Series machines are designed and built specifically for production carving. Packages are available for limited volume production of larger flat components, limited and high production of carved moldings up to 20 feet in length and high volume production of flat and three dimensional components such as posts and legs. Eight (8) 10 HP, 24,000 RPM spindles for a full 80 HP of carving power. Each spindle has an automatic tool changer and each can access up to eight individual tools. 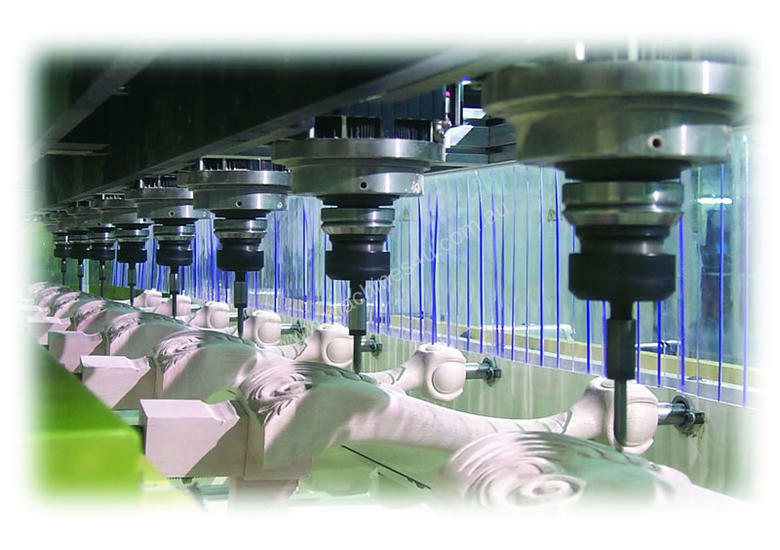 All eight spindles change tools simultaneously resulting in fast tool change times. 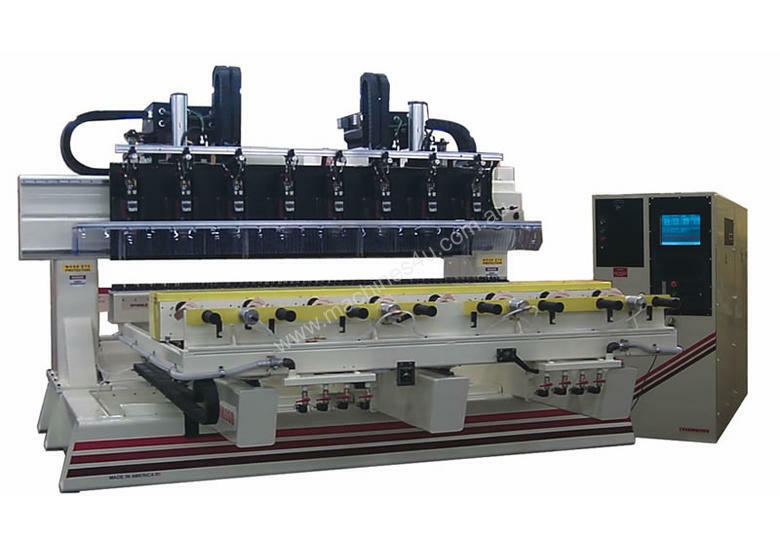 This system can be equipped with eight (8) rotary part mounts similar to those found on a multispindle carving machine, but these are servo controlled during both programming and carving. Eight parts up to 350mm in diameter and 1420mm long can be processed simultaneously. Even larger diameter parts can be carved using every other part position. Thermwood offers systems specifically for almost any production carving requirements. These systems are standard products, engineered, tested and refined yet are tailored to your specific requirements assuring you of effective and efficient production of your requirements. Over the years, Thermwood’s experience with production wood carving has resulted in methods, techniques and technology specifically focused on this area. All areas of programming and running have been refined through years of experience to develop the most effective, user friendly system available. Depending on your requirements, there may be an alternative to creating your own carving programs, rent them. Thermwood has established CNC program rental for carving programs. You can now rent complex carving programs on a per-part basis, right through your Thermwood control. It typically costs a few dollars per part to run complex carving programs already generated and refined. Thermwood has a growing library of carving designs available. In addition, Thermwood currently has, in its possession, thousands of carving patterns we are scanning and adding to the library. They include all types and designs including inset and raised carvings, crowns and shells, legs, feet and posts, finials, carved moldings, pilasters, onlays, Queen Ann, Ball and Claw, French, English, French Provincial, Classical, Modern, Caribbean, 18th Century French, English and American, Eclectic, Gothic, etc, etc. The carvings can be resized at the control for your specific application. If you can find designs within our library that will fit your requirements, not only do you save the time and effort required to create the program but you also save the cost and delay while an original model is developed. You could also rent the program for a part that is close to what you want, carve the part, then modify it and use it as an original model to create your own program. The possibilities are endless. This is another, patent pending feature only available from Thermwood.